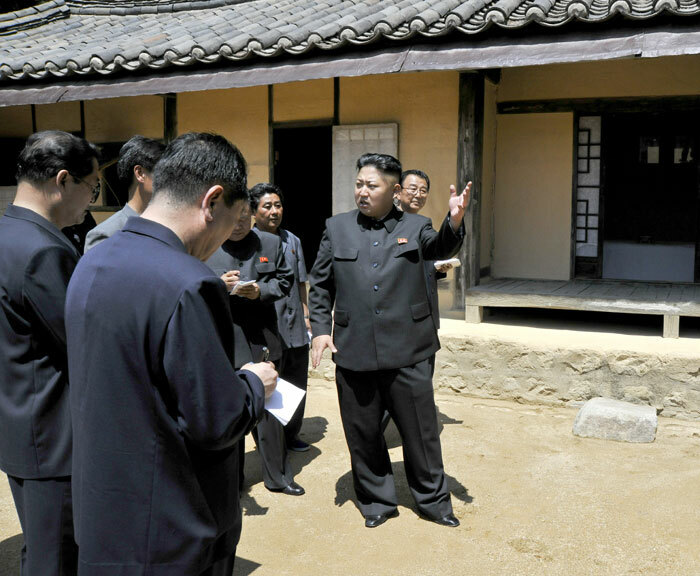 Kim Jong Un (R) tours the Ch’angso’ng Revolutionary Site in Ch’angso’ng County, North P’yo’ngan Province (Photo: Rodong Sinmun). DPRK state media reported on 13 June (Thursday) that Kim Jong Un (Kim Cho’ng-u’n) toured different locales in Ch’angso’ng County, North P’yo’ngan Province and toured Taegwan Glass Factory. Attending the visits were VMar Choe Ryong Hae (Director of the Korean People’s Army [KPA] General Political Department), Choe Hwi (Senior Deputy [1st vice] Director of the Korean Workers’ Party [KWP] Propaganda and Agitation Department), Pak Tae Song (Deputy KWP Department Director) and Ri Man Gon (Chief Secretary of the North P’yo’ngan KWP Provincial Committee). Kim Jong Un’s last reported public appearance was his visit to the Pyongyang International Football (soccer) School, the Rungna Sports Park and the offices of the State Physical Culture and Sports Guidance Committee. 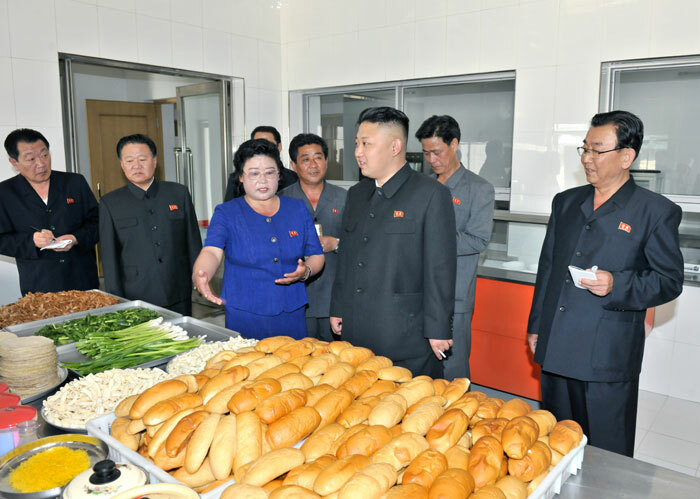 Kim Jong Un reviews a product display at Ch’angso’ng Foodstuffs Factory (Photo: Rodong Sinmun). 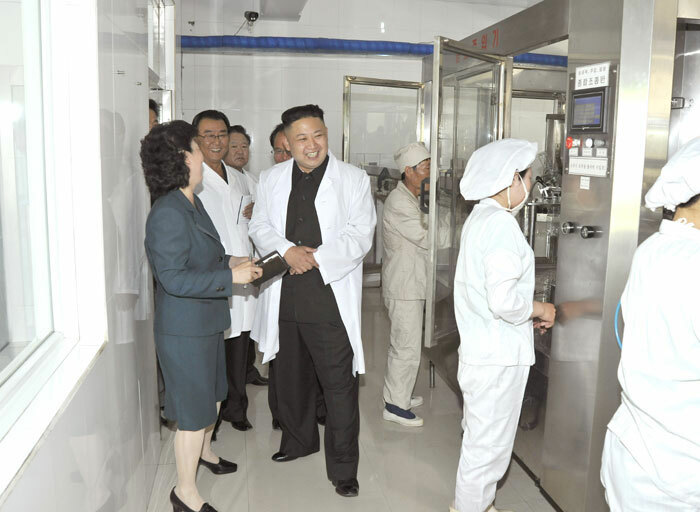 Kim Jong Un grins whilst touring a section of the Ch’angso’ng Foodstuffs Factory (Photo: Rodong Sinmun). 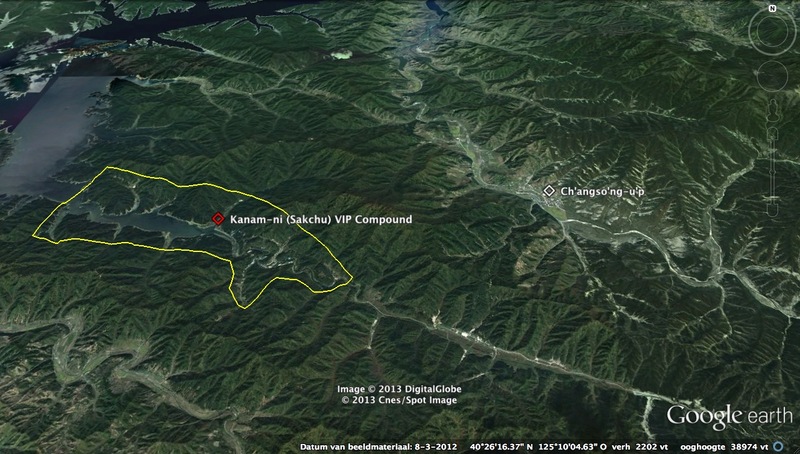 Kim Jong Un’s first stop in Ch’angso’ng County was to the Ch’angso’ng Foodstuffs Factory. 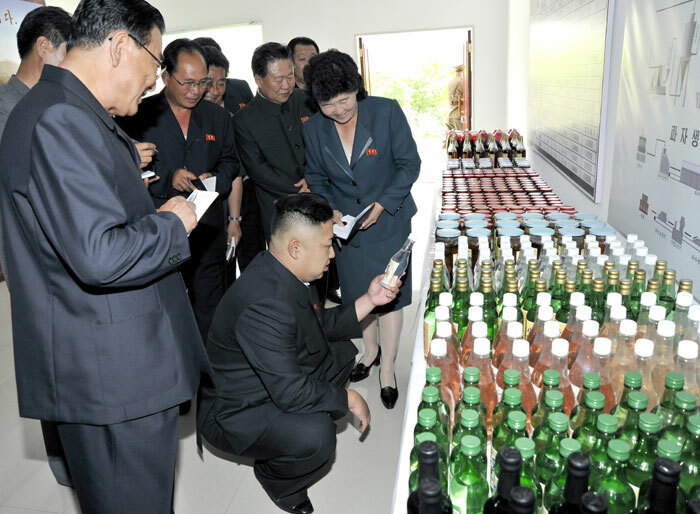 He toured the factory’s historical exhibition followed by “the milling work-team, liquor production work-team, confectionary production work-team, wild fruit processing work-team and the products show room and other various places of the factory.” According to KCNA he “praised the employees of the factory and officials in the field concerned not only for building it well as befitting a base specializing in processing wild fruits but achieving a lot of successes in carrying out the instructions given by Kim Jong Il to take the lead in wild fruit processing” and “underscored the need for the factory to more energetically push forward technological updating, not resting content with the successes already achieved, and steadily raise the level of technical skills of the employees and meticulously organize the factory and business management.” Kim Jong Un also “expressed expectation and belief that the employees of the factory would intensify the drive for increased production, bearing deep in mind the profound loving care shown by the great Generalissimos Kim Il Sung and Kim Jong Il for the people.” He ended his visit by posing for commemorative photographs with factory managers and employees. 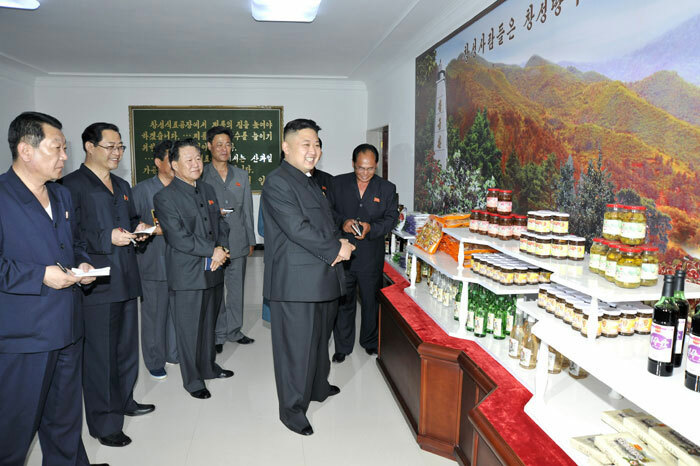 Kim Jong Un (2nd R) is briefed about products of the Ch’angso’ng Foodstuffs Factory (Photo: Rodong Sinmun). 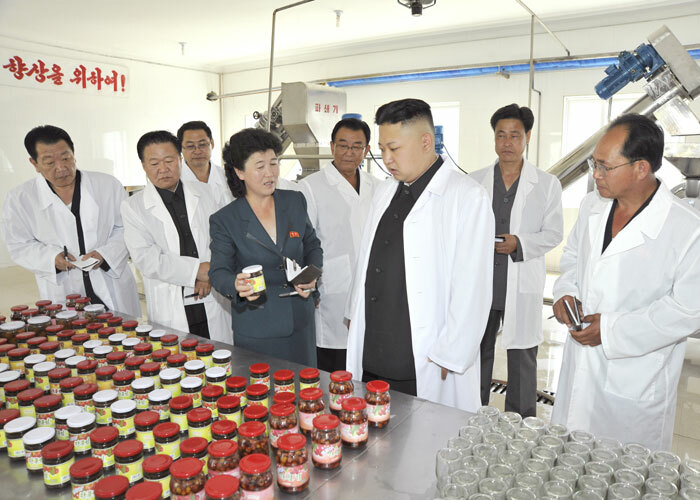 Kim Jong Un inspects a product of the Ch’angso’ng Foodstuffs Factory (Photo: Rodong Sinmun). Kim Jong Un smokes a cigarettes and reads a menu at the Ch’angso’ng Restaurant (Photo: Rodong Sinmun). Kim Jong Un holds a cigarette while touring a kitchen in Ch’angso’ng County, North P’yo’ngan Province (Photo: Rodong Sinmun). 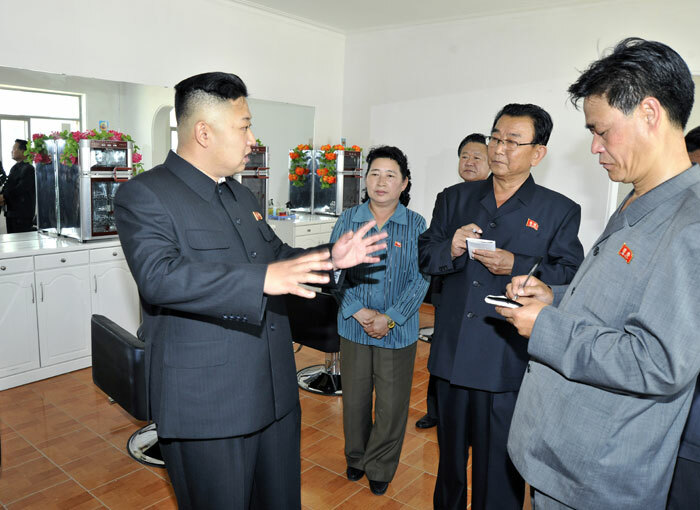 Kim Jong Un tours Undok Health Complex in Ch’angso’ng County, North P’yo’ngan Province (Photo: Rodong Sinmun). 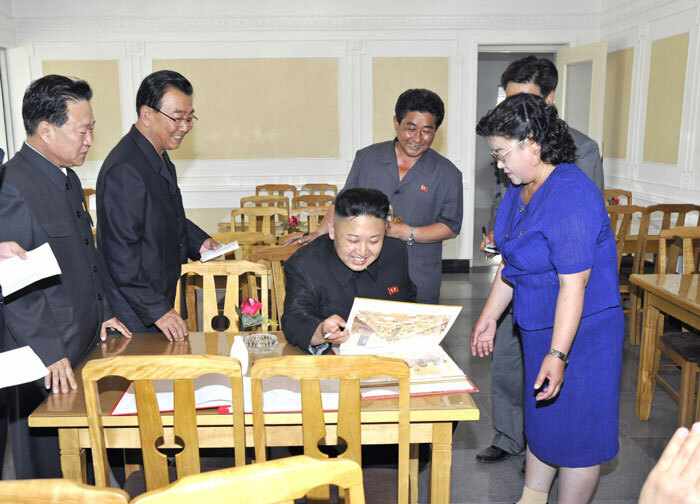 Kim Jong Un grins during a tour of the Ch’angso’ng Revolutionary Museum (Photo: Rodong Sinmun). 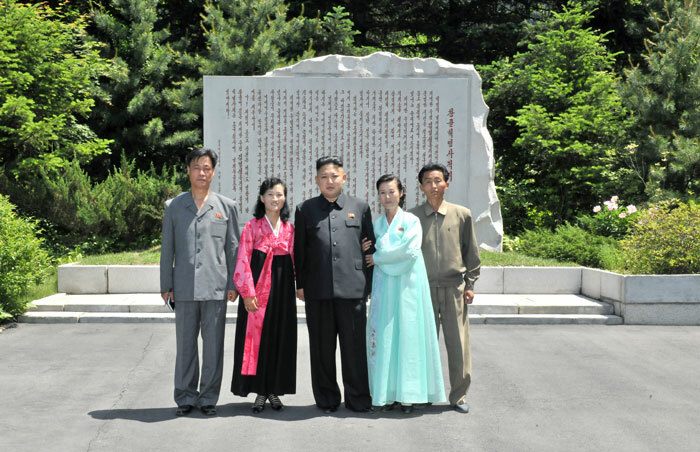 According to KCNA, he “called for sprucing up Changsong County as a people’s paradise and making hurrah for socialism ring out louder from the county” then attended a photo-op with museum employees. 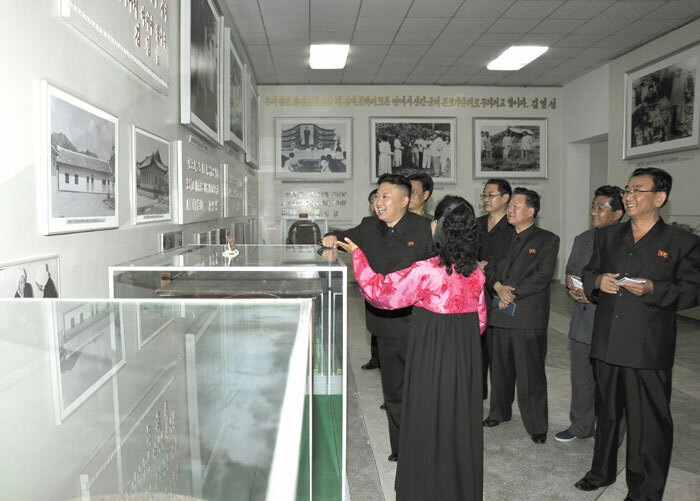 Kim Jong Un then visited the Ch’angso’ng Revolutionary Historical Site and the the county’s cultural hall. Of the revolutionary site he called for “preserving it on a permanent basis to educate party members and other people, soldiers and school youth and children in the immortal revolutionary exploits performed by Kim Il Sung in leading the Fatherland Liberation War (Korean War) to victory and his noble personality” and “proposed a task for creating art pieces depicting Kim Il Sung working at the revolutionary site.” At the cultural hall, he watched a performance by Ch’angso’ng County’s art propaganda squad. 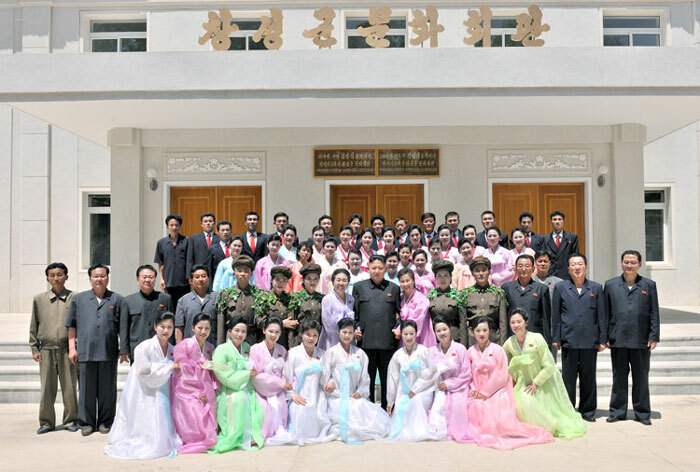 According to KCNA he “highly praised the members of the art group for giving a successful performance with great cognitional and instructive value by truthfully representing their life” then posed for commemorative photographs with the art squad’s members. 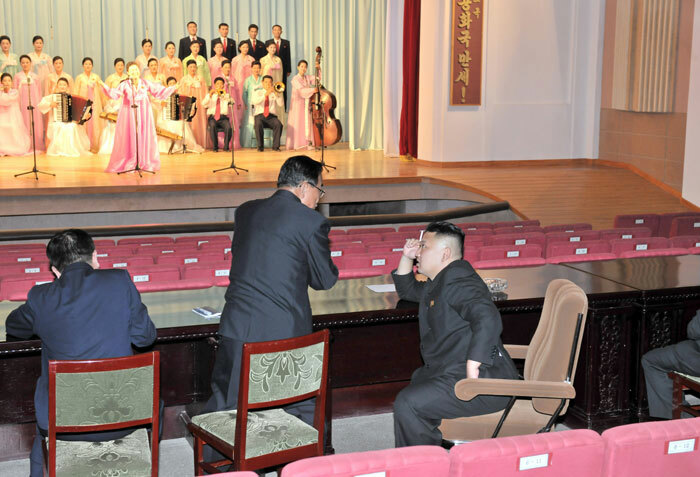 Kim Jong Un (R) smokes a cigarette and talks with a subordinate during a performance by the Ch’angso’ng County art propaganda squad at the county’s cultural hall (Photo: Rodong Sinmun). 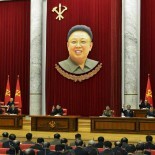 In August 1962, the late DPRK President and founder Kim Il Sung (paternal grandfather of Kim Jong Un) led the Joint Conference of Local Party and Economic Officials, which convened in Ch’angso’ng County. The meeting resulted in the publication, under Kim Il Sung’s name, of “Theses on the Socialist Rural Question in Our Country.” Kim Jong Il conducted multiple visits to sites Ch’angso’ng County and the county was established as a model for developing local economies in the DPRK. According to one official DPRK text, “experience of Ch’angso’ng County, North P’yo’ngan Province, a county which after Comrade Kim Il Sung’s field guidance there, made good use of its mountains, comprising 90 per cent of its whole territory, and turned itself into a rich and modern county by developing livestock farming and local industry.” The 50th anniversary of the Ch’angso’ng joint conference was held on 8 August 2012 at which a third generation of Kim treatises on the county, “Let Us Build All Counties into People’s Paradise Good to Live in by Embodying Historic Spirit of Changsong Joint Conference” by Kim Jong Un, was read. 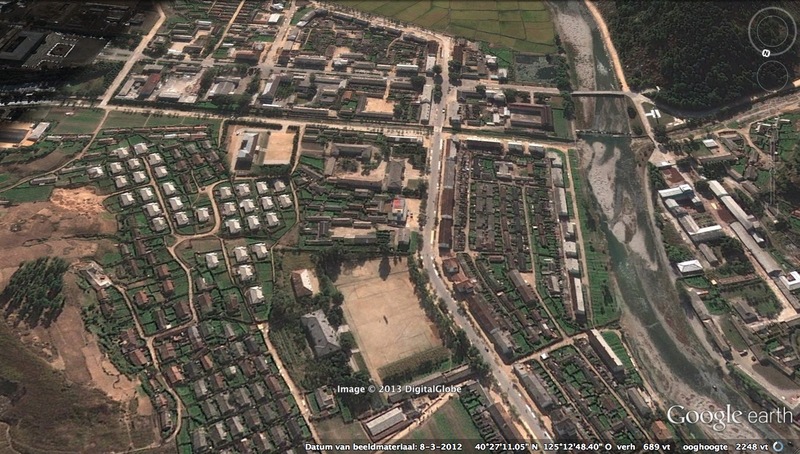 Ch’angso’ng County is also the location of a residential compound used by members of the Kim Family and other DPRK elites, which sits on the DPRK-China border. 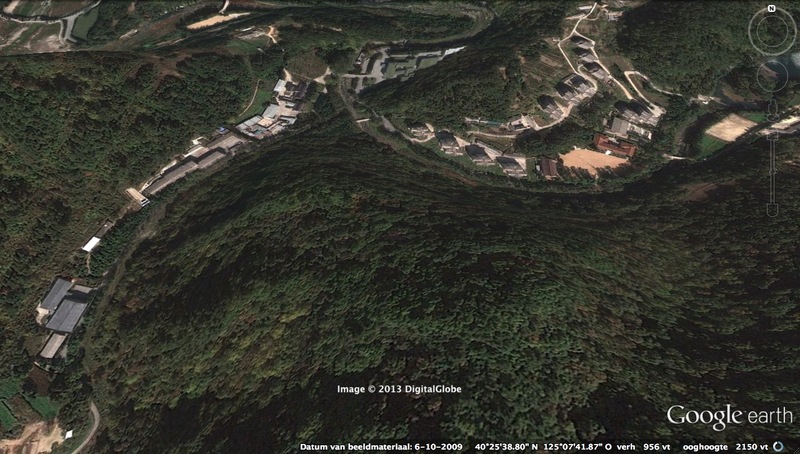 View of the Kanam-ri residential complex of the Kim Family and other DPRK elites (Photo: Google image). 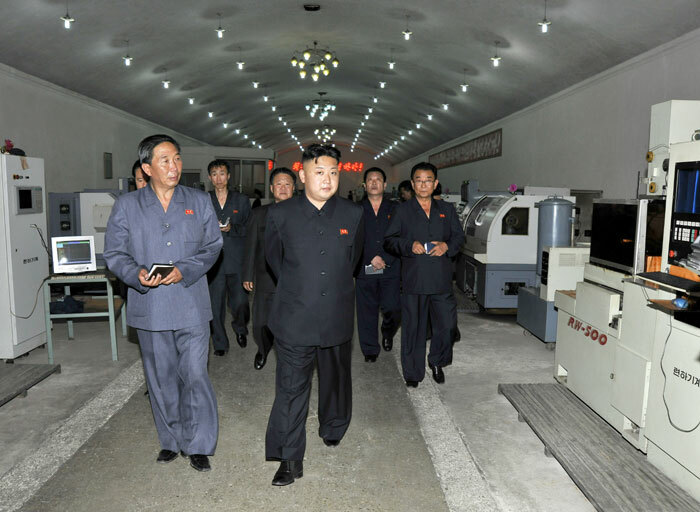 Kim Jong Un tours an assembling shop with CNC machines during a tour of Taegwan Glass Factory in North P’yo’ngan Province (Photo: Rodong Sinmun). 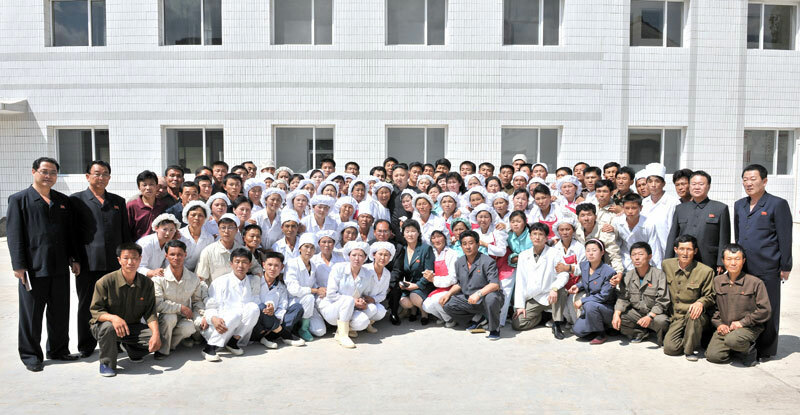 Kim Jong Un poses for a commemorative photograph with managers, officials and employees of Ch’angso’ng Foodstuffs Factory (Photo: Rodong Sinmun). 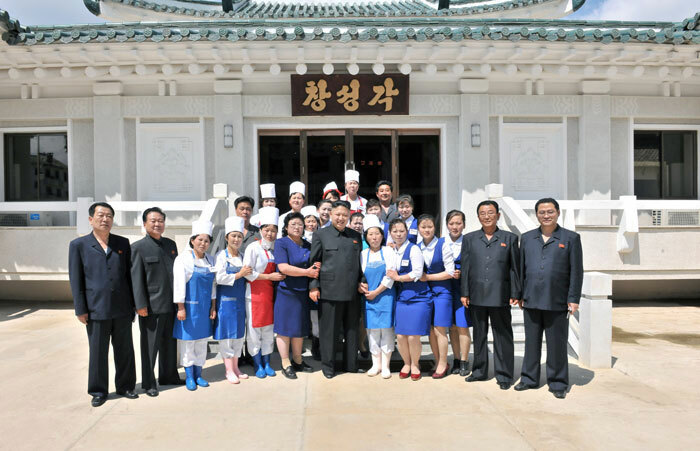 Kim Jong Un poses for a commemorative photograph with employees of a restaurant in Ch’angso’ng County, North P’yo’ngan Province (Photo: Rodong Sinmun). 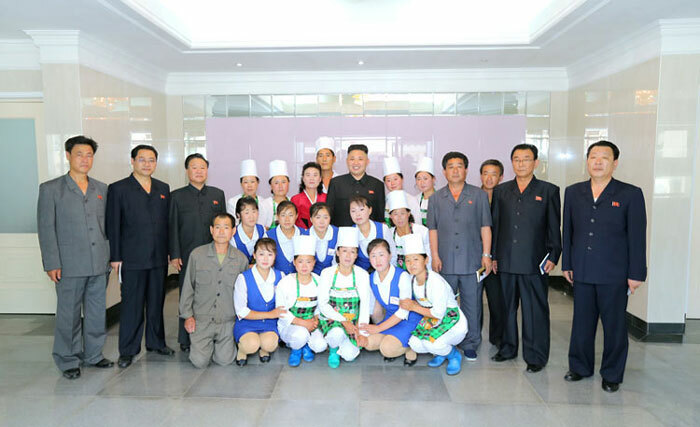 Kim Jong Un poses for a commemorative photograph with restaurant employees in Ch’angso’ng County, North P’yo’ngan Province (Photo: Rodong Sinmun). 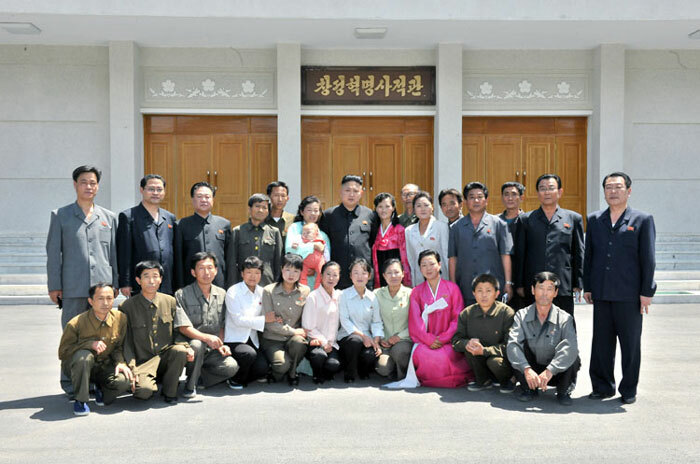 Kim Jong Un poses for a commemorative photograph with employees and officials of the Ch’angso’ng Revolutionary Museum (Photo: Rodong Sinmun). Kim Jong Un poses for a commemorative photograph with members of the Ch’angso’ng County art propaganda squad in front of the county cultural hall (Photo: Rodong Sinmun). 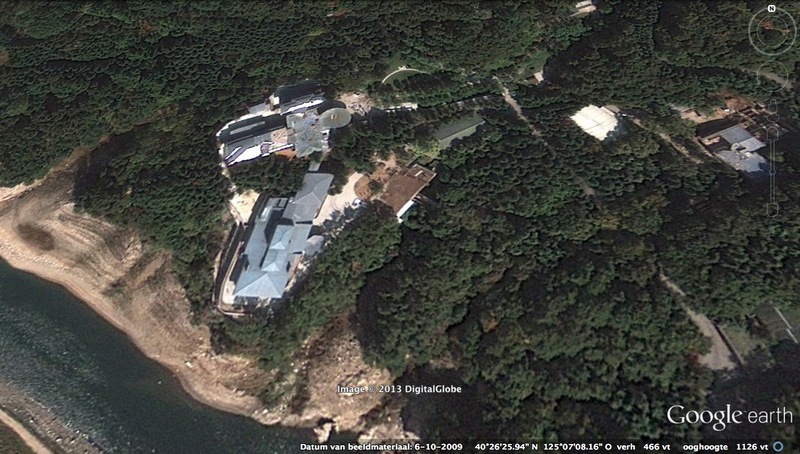 This entry was posted on 06/15/2013 by nkleadershipwatch in Central Committee, Central Military Committee, central party life, Choe Hwi (PAD], Choe Ryong Hae, critical infrastructure, DPRK Cabinet, Events Management Section, food production, Guard Command, ideological slogans, Kim Chong-un inspections, Kim Family, Kim Jong Un Visits, Kim Jong-il, Kim Jong-un, KJI Personal Secretariat, Korean People's Internal Security Forces, Korean Workers' Party (KWP), KPA General Political Bureau, KPA General Political Department, kpif, local people's committees, Masikryo'ng (Masiknyo'ng) Speed Battle (2013), Ministry of Construction and Building Materials Industry, Ministry of Machine-Building Industry, ministry of people's security, Ministry of State Security, MPAF GPB, National Defense Commission (NDC), NDC Administration Department, North Korean press, North Pyongan KWP Provincial Committee, North Pyongan Provincial People's Committee, Organization and Guidance Department, Pak Thae Song (KWP CC Dept), party life, Political Bureau, Propaganda and Agitation Department, Provincial Party Committees, Provinicial People's Committee, Secretariat, State Security Department.